My travels are not driven by my intentions to photograph, but without fail while traveling something sings out to say 'slow down, look more closely at this piece of our everyday world, consider its inherent wonder'. During recent travels to the Peloponnese and Puglia, it was the acacia trees that lined roads in small towns that we visited in the former and the wild fennel that grew as weeds in untended plots of land in the latter that called out to me. It was impossible not to respond to the graceful calligraphic arcs of the acacia fronds and the humorous puff balls of the wild fennel. The result is a new suite of images, Acacia and Wild Fennel, now available through my galleries. Pieces from the suite can be seen currently or over the next few months at Kathryn Markel Fine Arts in Chelsea, Amy Simon Fine Art in Westport, Catherine Couturier Gallery in Houston, Cumberland Gallery in Nashville, and Ann Connelly Fine Art in Baton Rouge. Contact me if you’d like details. Pieces from my most recent series, Songs of the Sky, Revisited, will be presented as part of the exhibition "Photography" at Carrie Haddad Gallery in Hudson, New York, opening August 1. 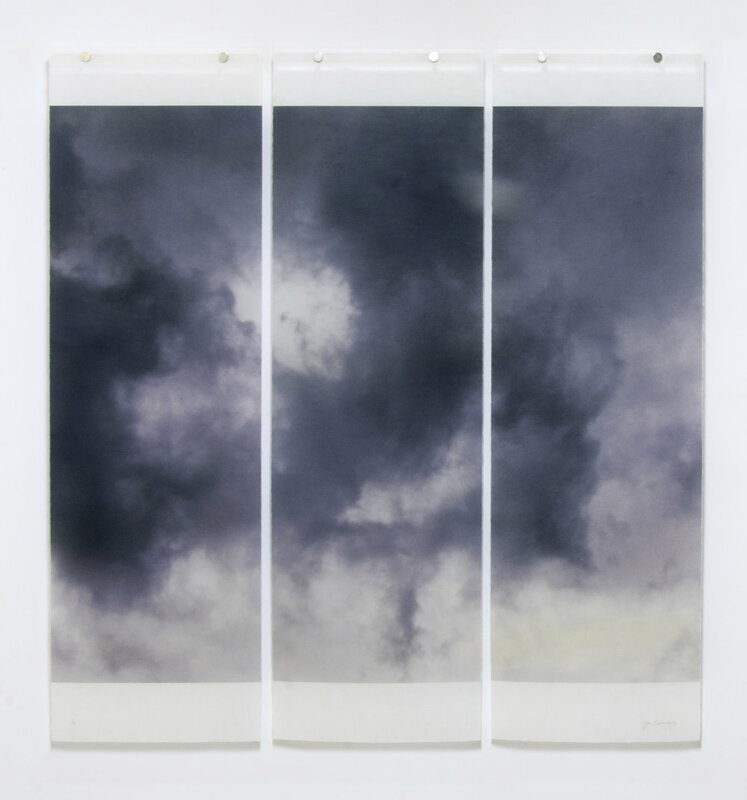 This new work consists of sometimes subtle, sometimes dramatic tonality shifts of monochromatic pieces of sky. With an acknowledged nod to Alfred Stieglitz's Equivalents, the series furthers my own inquiry into the possibilities of contemporary abstracted images of the sky that convey inarticulable emotion. And, like most of my work, it attempts to capture the often sublime nature and ephemeral beauty of that which surround us. The exhibition will extend through September 16. Please stop by if you are in the area. We had a sprinkling of snow again this morning in upstate New York, but my spring blossoming trees have been gracing the wall at Sozo Gallery in Charlotte, NC this month. I'm the featured artist there for April, and some of my magnolias, crabapples and dogwoods will still be on view for the next two weeks. Wish I could see them in person! I'm very happy to share that some of my work is being exhibited at Page Bond Gallery in Richmond, VA as part of their View Find 7 show. Golden Trumpets is being exhibited along with work by Emmet and Elijah Gowin, Amanda Means, Mary Ellen Bartley, Christa Bowden and others whose work I greatly admire. The exhibit begins today and runs through February 17. Golden Trumpets is a piece from my suite of images, Hard Light/Hot Color, which I began while in residence at the Maitland Museums in central Florida. Other pieces from the suite can now be seen on this site under the Projects - New Work link. Take a look, or visit in person if you are near Richmond! Carrie Haddad Gallery recently framed and hung some of the work from my Warm Waters series. If you travel near Hudson, NY, which is always a treat, stop in to see this new work. Should you be lucky enough to be in Sun Valley in September, please stop into my show 'Warm Waters' at Gilman Contemporary. Work from this new series evoking the power and majesty of the ocean will be exhibited from August 31 through September 29. I'm happy to have work currently showing on both sides of the country, as well as a few stops in between, as part of summer gallery exhibitions. Work from my long term 'Sojourn in Seasons' series is currently on view in San Francisco at Corden Potts Gallery and in Westport, Connecticut at Amy Simon Fine Art. Work from my brand new series, 'Warm Waters', will be on view shortly in Nashville at Cumberland Gallery and in Sun Valley at Gilman Contemporary. Work from the new series will also be available for viewing at Catherine Couturier Gallery in Houston. If you have the opportunity, please stop in to one of these locations to take a look, and to say hi to the wonderful people showing the work! Warm Waters, No.21, 36" x 45.5"
Thank You, Maitland A&H Museums! I spent most of the month of April in an artist residency with the Maitland Art and History Museums in Central Florida. It was delightful to spend so much time dedicated to creating new work in an environment so completely different from that in which I spend most of my time. The light was crystal hard, the colors electrifyingly bright and the foliage amazingly lush. The Tabebuia trees bloomed with their golden trumpets a few days after I arrived and retained their glorious show for almost two weeks! I was so glad they graced the historic grounds on which I lived and worked. I am very grateful for the opportunity that was provided to me, and thank the very helpful and professional staff associated with the A&H Museums. I'm very honored to have my work exhibited as part of this show at the Albany Institute of History and Art, selected from the museum's collection. The exhibit will extend until May 21, 2017. Please stop in if you are in the vicinity. I'm delighted that Four Square Fine Arts from the UK will be presenting my work at the Stockholm Affordable Art Fair. The show starts on Thursday, the 13th and runs through Sunday, the 16th. Four Square Fine Arts has brought my work to another art fair in London! AFF Hampstead runs through this week. Two of my pieces are hanging in frames there. Thanks so much, Sonia! It may not yet be spring meteorologically, but Amy Simon Fine Art in Westport, CT will be filled with images of spring in the show 'Good Nature', opening this Saturday, March 12 and running through April 23. A number of my newest images from the series 'A Sojourn in Seasons' will be shown, along with work by Cara Enteles and Liz Dexheimer. The open house is Saturday from 2 to 4 pm. Share some spring with us! Four Square Fine Arts will be showing my work again in London starting next week at the Affordable Art Fair there. Framed images of dogwoods from my "Sojourn in Seasons" series will be on the walls, harbingers of spring to come. I'm very pleased to see this installation shot of one of my Sojourn in Seasons pieces at the London Art Fair. Four Square Fine Arts has included my work in their booth at the fair this week. Thank you, Sonia! If you are on that side of the pond, the fair continues through January 24. The piece on the left is by painter Martha Winter. Pieces from both my Sojourn in Seasons series and Traces (After Anna) series are being shown this month and extending through February 14 at Carrie Haddad Gallery in Hudson, NY. Also on the walls are works by Kahn & Selesnick, David Halliday and Eric Lindbloom. The gallery looks great! I'm very happy to announce my new representation in the UK by Four Square Fine Arts. I'll be showing there with a wonderful group of international artists. Take a look at the brand new work that is currently across the pond! A selection of work appropriate for the upcoming fall season from my long-term series, "A Sojourn in Seasons", is showing at Diehl Gallery in beautiful Jackson Hole. The gallery did a wonderful job installing and promoting the work as part of the city-wide fall arts festival. The show opened on September 11 and continues through October 11. Please take a look if you are lucky enough to be in or traveling near Jackson Hole!